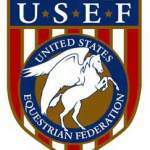 Equine regenerative medicine is a newer area of equine medicine. It encourages the horse’s own body to heal itself. 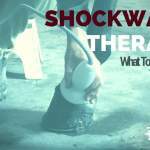 This is not a ‘new age’ therapy, but specialized medicine backed by clinical research.Though still in its infancy, regenerative medicine holds much promise and potential in the horse health community. 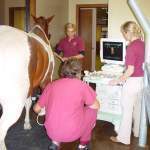 Unlike the human community, which generally reserves regenerative medicine for serious illness or injury, the equine medical community uses it regularly to treat common lameness problems. In some cases it may be more cost effective and provide better results than traditional methods of managing pain, injuries, and other health conditions. In 2007, Italian researchers published a study of two groups of horses with tendinitis. Among the 11 horses that received stem-cell injections and returned to racing, nine remained injury-free a year later. Of the 15 control horses that received a more conventional course of rehab, all re-injured themselves within a year. Equine regenerative medicine is currently being used to treat tendon and ligament injuries, fractures, wounds, and degenerative joint disease (arthritis). Adult stem cells (not embryonic cells), which can be transformed into nearly any type of cell, as well as protein or platelet rich serums each play an important role in healing. By using patient-derived materials, equine regenerative medicine is making tendon and ligament injuries heal stronger, heal wounds faster, and repairing the damage done by arthritis. At Mid-Rivers, we offer several types of equine regenerative medicine: Shock Wave Therapy, Interleukin-1 Receptor Antagonist Protein (IRAP), Platelet Rich Plasma (PRP), Stem Cell Treatment, and Cold Laser Therapy. PRP Treatment of Ligament Injury, Dr. Burny Baxter. IRAP Therapy (Interleukin-1 Receptor Antagonist Protein) is used to treat degenerative joint disease (arthritis). Blood is drawn from the horse’s jugular and a protein rich serum is cultivated. This serum is then injected into the affected joint. The serum promotes a regenerative response by the cartilage cells, helping to restore the joint lining and cartilage function. Learn more by reading IRAP Therapy – Treating Degenerative Joint Disease. 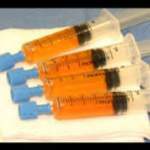 PRP (Platelet Rich Plasma) is used to treat tendons, ligaments and wounds. Platelets are rich in growth factors that help repair tissue and ligaments more quickly. Blood is drawn from the horse and spun in a centrifuge where PRP is cultivated and harvested. The platelet rich serum is then used to treat the injury or wound. The PRP increases the effectiveness and efficiency of the growth factors speeding up the healing process. Equine stem cell therapy is used to treat superficial digital flexor tendon (SDF), stifle injuries and suspensory ligament lesions. Adipose fat is collected from the horse’s hip or sternum. Using culture expansion techniques, the sample will produce five million or more cells that can then be used for treatment. 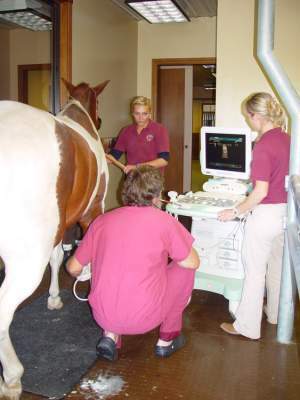 The doctors at Mid-Rivers Equine began using stem cell therapies in the mid-1990s. 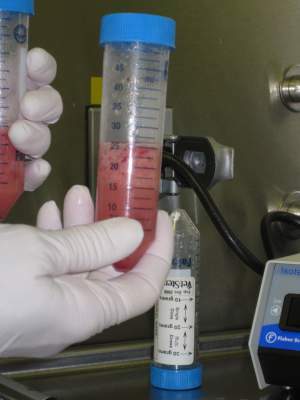 The collection techniques are the same today as then, however an outside lab is now scheduled at the same time as the procedure’s scheduled appointment, the sample is processed and the stem cells concentrated prior to being injected into the injury or lesion. If you are interested in exploring IRAP, PRP or Stem Cell treatments for your horse, please contact the clinic at 636-332- 5373 to request an appointment. 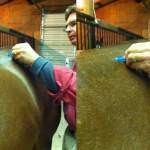 Is Low Level Laser Therapy (LLLT) Right For Your Horse?